So, you're like most teachers out there...broke and the availability of supplies, read alouds and technology never seems to be sufficient. Times are tough, but you're dedicated and YOU want to make sure that your students have what they need to succeed, which is why you're willing to sacrifice what little money you have to ensure that your classroom is an inviting, engaging place. JoAnn Fabric and Craft Store - 15% off every day purchases and 25% off on educator appreciation days. Staples- 5% back in rewards, along with free online shipping and special offers. Office Max- Office Max offers the Max Perks program, which gives you $10 for every $75 you spend. Michael's - 15% off in the store with your Teacher I.D. Sometimes stores will take any document that proves you work at a school if you forget your I.D. A.C. Moore- 15% off in store if you have your ID. They don't have anything advertising a discount on their website, but the stores I've been to usually offer a discount. Apple Store- The Apple Education Store offers a variety of discounts for schools and teachers when you find your school on their website and order through the website. Scholastic- Now called the Reading Club, Scholastic offers teacher bonus points on parent orders using your access code. Teachers can use their bonus points to purchase books from Scholastic's website. They do a GREAT job of providing special offers to help you rack up those points! The Container Store- They offer the "Organized Teacher Discount" which advertises discounts to be shared with teachers throughout the year. 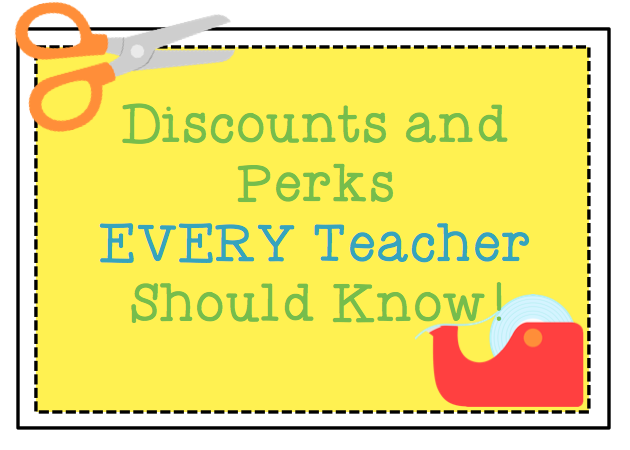 Finally- be sure to ASK EVERY STORE if they offer teacher discounts. Many places will be happy to throw in a discount if you have your I.D. There is absolutely no harm in asking!